One of the popular fairs of Northern India is the Flag Fair of Dehradun which is more popularly as Jhanda Mela or Jhande Ji ka Mela. This Jhanda Mela starts on the fifth day of Chaitra (the fifth day from the Holi) which is the birthday of Shri Guru Ram Rai Ji. Other than being the birthday of Guru Ram Rai, it is the day he came to Dehradun in 1676 AD. So this Flag hosting ceremony is celebrated at Guru Ram Rai Darbar Sahib, Jhanda Bazar in Dehradun by his large number of devotees to remember Shri Guru Ram Rai Ji every year. History of Jhanda Mela is directly connected with the Shri Guru Ram Rai who was the eldest son of the seventh Sikh Guru Shri Har Rai Ji. When Aurangzeb seated on The Mughal Emperor Throne, he blamed on Shri Guru Har Rai Ji for helping Dara Shikoh who was the Aurangzeb’s brother. Aurangzeb and Dara Shikoh were fighting with each other for the power and Throne. So Aurangzeb called to Shri Guru Har Rai Ji in Delhi for explaining reasons. Shri Guru Har Rai Ji very wise and clearly understand the reasons behind this so he sent his eldest son Shri Guru Ram Rai. Aurangzeb received Guru Ram Rai and asked about this matter. Then Guru Ram Rai Ji very cleverly satisfied to Aurangzeb with his answers and impressed him. So Aurangzeb requested to Guru Ram Rai for staying as a state guest for some periods. Once, Aurangzeb asked Guru Ram Rai why Sikh Guru Sri Guru Nanak criticized Islam as “Mitti Musalman Ki” then he replying that actually, it is “Mitti Baimaan Ki” not as “Mitti Musalman Ki”. Guru Ram Rai’s father Guru Shri Har Rai Ji strictly instructed him to only explain to Aurangzeb Guru’s position but Guru Ram Rai misinterpreted Sri Guru Nanak’s writings which is completely banned for anyone. Also, Guru Ram Rai please to Aurangzeb by performing various miracles. So when Guru Shri Har Rai Ji knows about it he not allowed to Guru Ram Rai to return home for a lifetime. He was rejected by his own father or Guru, community and relatives and forced to leave his birthplace Panjab. Then Guru Ram Rai remained associated with Mughal Emperor Aurangzeb’s court and Aurangzeb honored him as Hindu Pir. Aurangzeb asked Garhwal’s Raja Fateh Shah to do all possible support to Sri Guru Ram Ji. So for establishing himself as a Guru in another area, Guru Ram Rai Ji came in ‘Doon valley’ in the year 1676. During the tour in Doon valley, his horse’s foot hit in the ground and stick in it. So Sri Guru Har Rai order to all his accompaniment to stop here and then he shoots an arrow in all four directions and said to his accompaniment to use that area which was covered by all four arrows. Guru Ram Rai setup a Jhanda for mark the location of his camp or Dera which becomes very popular later. Then he and his accompaniment setup a ‘Dera’ (camp) there which was popularly called as ‘Deradoon’. This Deradoon later becomes Garhwal (Uttarakhand's) capital as now known as Dehradun. 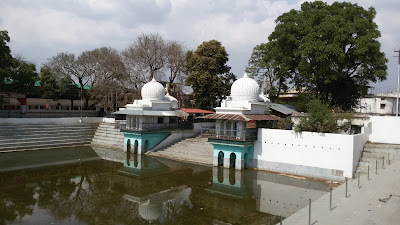 The place where the Guru Ram Rai Durbar Sahib is situated called as Dhamawala. As per order of Mughal Emperor Aurangzeb, Garhwal’s Raja Fateh Shah give six villages as an estate to Guru Ram Rai. 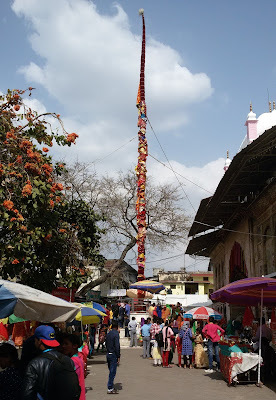 The popular Jhanda of the Jhanda Mela is made from a ‘Sal tree’ trunk. 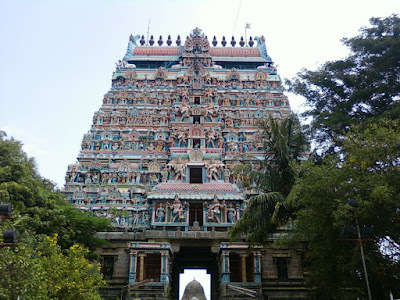 The length of this huge Jhanda is about 27 meter or 100 feet. After 5-6 years this Sal tree trunk changed and new Sal tree trunk used for the Jhanda. This Jhanda is wrapped with 63 layers of cloths or called as ‘Gilaaf’. The starting 41 layers of Gilaaf is simple plain cloth called ‘Jhanda Ji’ then followed 21 layers of velvet cloth called ‘Shaneel’ and the final outer covering of ‘Darshani cloth’. The cloths of the Jhanda of Jhanda Mela every year changed. The cloth used for wrapping on Jhanda is very long. Peoples said that Jhanda inside the ground and above the ground is in the same length. Before starting the famous Jhanda Mela, preparation of Gilaafs for the Jhanda started by devotee women who started the stitching work of Gilaafs’ (cover) for the Jhanda by using sewing machines. It is believed that the women who get this opportunity will be free from their sins so every year, women wait for when they are invited and they get involved in the service. Jhanda Mela celebration started on the fifth day of Holi and continues for a month. A large number of Guru Ram Rai devotees started to arrive at Sahaspur in Dehradun before the Flag fair starting. Devotees come mainly from the Uttarakhand, Uttar Pradesh, Delhi, Punjab, Haryana, Himachal Pradesh, Rajasthan and other parts of the country and also from the abroad who want to be witness and part of the Jhanda Mela. These crowd of men, women, and children of different age groups called ‘Sangat’ (accompaniment). There is very well arrangements for the all devotees for staying here in Shri Guru Ram Rai Public Schools various branches and Dharamshalas of Dehradun. As per tradition prior to the Flag fair, the Mahant of Shri Guru Ram Rai Darbar Sahib goes to Sahaspur on foot to take the ‘Sangat’. Then Sangat moves from Kanwali area to Shri Guru Ram Rai Darbar Sahib. Before joining this holy flag hosting ceremony devotees takes a bath (dip) in the Holy tank situated at the Darbar Sahib. The fair begins in the early morning around 8 o'clock with lowing the flag (Jhanda) and removing old cloths covering. 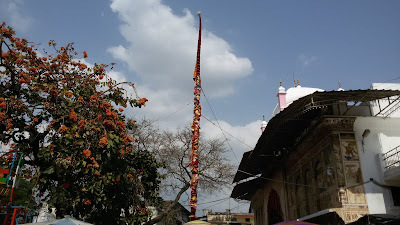 Then this flag pole (Sal tree trunk) is washed with water of Holi Ganga River, milk, curd, honey, Ghee and Panchamrita. Then started to cover (wrapping) this with Gilaafs, in which 41 layers of ‘Jhande Ji’ cloth, 21 layers of ‘Shaneel’ and last and very decorative one ‘Darshani Gilaaf’. During this whole procedure, Jhanda never kept on the ground for a single second. After completing this whole procedure in 4-5 hours Jhanda ready to fix and with the help of devotees Jhanda is hosted at its place. Devotees are so excited and happy and making joyful sounds during this time. After the flag is hosted devotees started to offer their handkerchiefs or scarves in prayer for blessings and fulfilling their wishes. Each and every year the old Gilaafs (Jhanda cloths) distributed among all Guru Ram Rai devotees as a Prasad. The old pieces of the Gilaaf are taken by all accompaniment. There is also a very long list of devotees who want to sew a cover for the flag. The main long waiting list is for the ‘Darshani Gilaaf’ for offering to Jhanda during Jhanda Mela is reached to the year 2116 and for the Saneel Gilaaf, it is the year 2043. Guru Ram Rai Darbar is not a Gurdwara it is actually a monument which follows the Udasin tradition. Jhanda Mela is organized by the Shri Guru Ram Rai Darbar Sahib (Udasin) every year which is open to all religion’s followers who believe in Guru Ram Rai Ji. As per present Mahant of Shri Guru Ram Rai Darbar Sahib (Udasin), Jhanda Mela is a message of harmony, goodwill, mutual brotherhood, joy, and peace. For the hosting Jhanda Ji peoples come from different religions, castes, and states every year which promotes communal harmony among peoples. Each and every year devotees come from every part of India and also from abroad jointly celebrated this Jhanda Mela. There is no one poor, rich, lower level or upper-level person each and every jointly with mutual harmony and supporting each other organized this festival. That’s why till date devotees of all classes, community, castes, and creed visit Jhanda Mela every year and every year number of devotee’s increases from the previous year. There are lots of shopkeepers install their temporary shops in this area during these periods. The shops include kid’s toys item, food stalls, ladies cosmetic items, grocery and many more with lots of Jhoola for kids. There are also lots of Prasad selling shops near the famous Jhanda of JhandaMela. There is a huge crowd in the market so be careful during the shopping in the market and keep kids with you. Every year on the fifth day from Holi or Chaitra Krishna 5 day in Phalguna month of Hindi calendar. Function timing: Morning 05:00 am to Evening at 09:00 pm. Jhanda Mela is the full day ceremony so you have to plan accordingly. 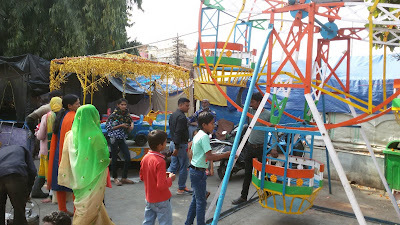 Jhanda Mela celebrated for fifteen days starting from Holi fifth day. 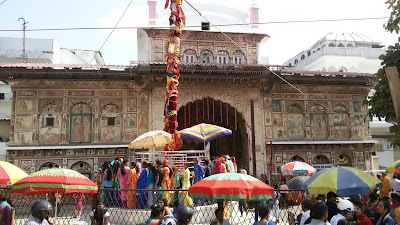 Jhanda Mela is celebrated at Flag Market, Akhara Bazar, Saharanpur Chowk in Dehradun where the Shri Guru Ram Rai Darbar Sahib (Udasin) is situated. It is at walkable distance from the Dehradun railway station and about 1 km. The distance from the Dehradun Bus stand (ISBT) is only 5 km. You can get the easy auto, taxi and local bus from both places railway station and ISBT. Dehradun Airport is 25 km far away from this place so you take a taxi, auto or cab which is easily available. Dehradun is well connected from the other cities by railway, state roadways buses, and airplanes. For Delhi, to Dehradun, there are lots of trains and AC and non-AC buses, Volvo services for Dehradun is available at every hour basis. By bus and train, it is only a 5-6 hour journey from Delhi to Dehradun. There are many Aeroplanes for Delhi to Dehradun. Nice post, looking for more interesting travelling places. I am a professional Biotechnologist by profession and a traveler by heart. I loves to travel and visit tourist places. Travelling is my hobby and passion. Till date I visited more than 60+ cities and traveled more than half states of India. © Copyright By Tourist Bug All Rights Reserved. Awesome Inc. theme. Powered by Blogger.